Kelly launched aboard the Russian Soyuz Rocket on March 27 2015, along with Russian cosmonauts Genaldy Padalka and Mikhail Kornienko (joining Kelly on the one year mission). Before, during and after the 340 days he spent aboard the International Space Station, a large volume of biological samples was collected from both Scott and Mark. 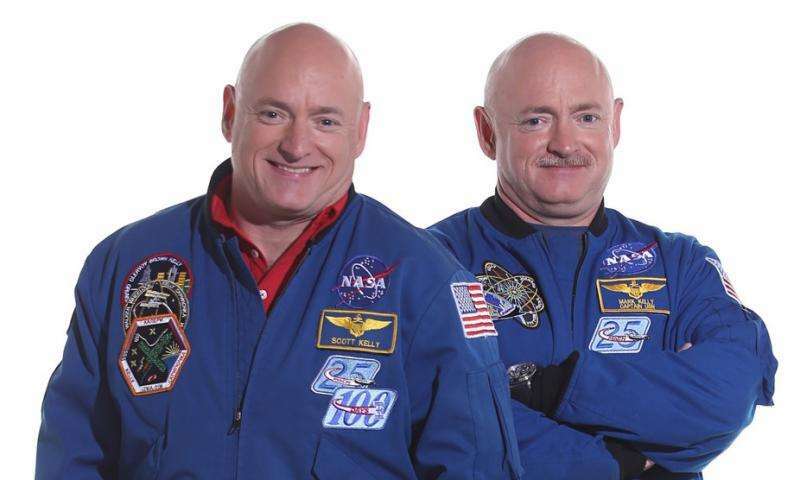 By looking at molecular changes between the identical twins that were separated at launch, NASA hope to shed light on how certain proteins and bacteria in the body are influenced by nature or nurture by taking advantage of the extreme environmental differences between living on Earth or in space. Space agencies around the world have a shared goal of taking people to Mars. Missions to Mars will involve crews spending about three years away from Earth's gravity, taking about six months travelling to Mars in microgravity, followed by more than a year on the Martian surface, living and working in about a third gravity we experience on Earth. This is before the planets realign and it's time for the six-month return journey back home. In order to safely complete this journey, effective countermeasures to the potential influences of the extreme environment of space on the human body must be developed. Previous missions to the International Space Station have identified many of the effects of microgravity on human physiology. Muscles, especially those that help support the body's posture against gravity, waste away, bones become less dense, increased pressure in the skull leads to visual impairments and the amount of blood in the body reduces. As if that wasn't enough, the heart also gets smaller as it can pump blood to the brain more easily and cosmic radiation can lead to increased cancer risk. 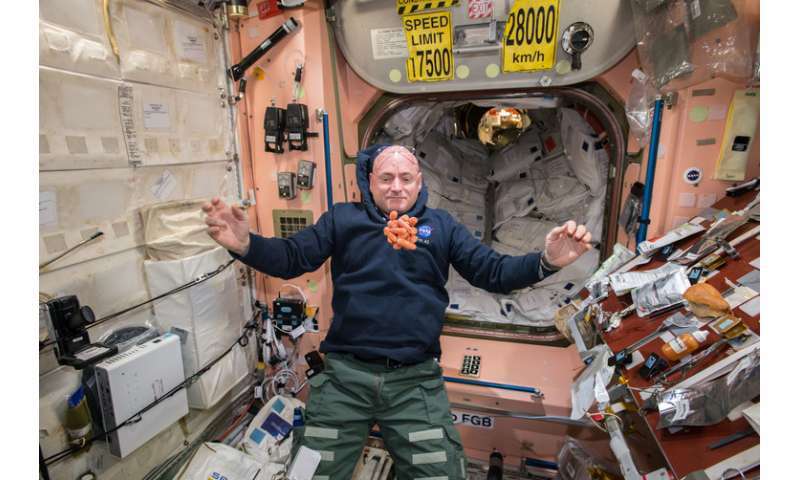 To counteract all this, astronauts on the International Space Station complete a rigorous exercise programme (about two hours daily), accompanied by a strictly planned diet. The NASA Twins Study uses the relatively new field of omics – the study of a large number of systems in the human body at a molecular level. Initial findings involved telomeres – often described as the "ticking clock of the cell". Telomeres are DNA sequences at the end of chromosomes – protecting them from degrading. As we age, the telomeres get shorter and shorter. The study found that telomeres in white blood cells get longer in space. This was potentially thought to be due to the increased exercise regime and strict diet that Scott followed, but perhaps Einstein's time dilation effect could be playing a part in astronauts' telomeres seemingly ageing slower. Despite this, markers of inflammation in the blood increased in space and after landing back on Earth, which could have been caused by the physical stress placed on Scott's body during re-entry and landing. Some changes to DNA were also seen in Scott's gene expression. This finding could help identify specific genes that are sensitive to environmental stress so that we can help protect them. During the second half of Scott's mission, bone formation also reduced, which is more commonly seen in osteoporosis. Astronauts will need to reach Mars and be able to perform physical and cognitive tasks to survive for months on end in the partial gravity environment of the Martian surface. They will have to construct the habitat in which they will live, perform system maintenance and carry out scientific research. By understanding how microgravity influences astronauts' DNA, drugs and other countermeasures can be developed to prevent these changes and ensure that astronauts stay healthy. Of course, it is not all about exploring the solar system. Many of the global space agencies aim to study how space affects the human body in order to improve healthcare interventions for patients on Earth. As the use of omics develops, it could lead to personalised healthcare. By using these techniques to comprehensively analyse blood samples taken in hospitals, or even in doctors surgeries, it might one day be the case that doctors can predict whether a patient might develop a certain disease, and prescribe preventative drugs to reduce the likelihood of the patient becoming ill in the first place. Findings from NASA's Twin Study could, therefore, help us living longer and healthier lives on Earth.